Colonized by the Dutch in 1661, the coastal neighborhoods of Middle and South Beach had changed little until the l880s, when investors recognized the potential of local beaches already teeming with New Yorkers trying to escape the city’s summer heat. With the addition of hotels, bathing pavilions, theaters, beer gardens, shooting galleries, carousels, and Ferris wheels, the area became a popular resort almost overnight. Soon several casinos as well as the Happyland Amusement Park took full advantage of the seasonal closing of most Broadway theaters and began hosting Vaudeville shows during summer. By 1890, ferries, trains, and trolleys were filled with vacationers and day-trippers. Just a few decades later, fires, water pollution, and the Great Depression (1929-1941) took their toll on the resort and the crowds disappeared. In 1935, the City of New York acquired this property and it underwent renovations performed by President Franklin Delano Roosevelt’s (1882-1945) Works Progress Administration (WPA). In addition to removing the deteriorating music halls, carousels, and shooting galleries, the WPA also laid down the present two and a half-mile long boardwalk. In 1939, it was dedicated to the former governor and president. Children can now enjoy Parks-maintained playgrounds, baseball fields, handball, and shuffleboard courts. There are also bocce courts, checker-tables, a skateboard park, a roller hockey rink and a long pier for year-round fishing. 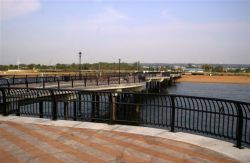 Franklin Delano Roosevelt Boardwalk and Beach is also home to the Midland Beach War Memorial. The Midland Beach Community Center sponsored the Barre granite tripartite slab with an inscribed eagle perched atop a pedestal. It memorializes Staten Island’s contribution in World War II (1939-1941), the Korean War(1950-1953), and the Vietnam War (1964-1975). Another nearby monument is dedicated to Vietnam veteran and Congressional Medal of Honor recipient Navy Chaplain Lieutenant Colonel Vincent R. Capodanno (1929-1967). A flagstaff and plaque, donated by the Cespino-Russo Post of the American Legion, stand at the site. The Fountain of The Dolphins graces the boardwalk area. 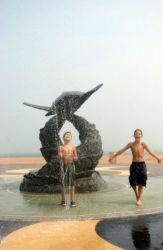 Donated by the Staten Island Borough President’s Office and sculpted by Steven Dickey in 1998, the fountain contains six bronze dolphin figures. Wave-shaped rails containing fiber-optic cables and water jets emitting green, blue and white lights illuminate the fountain at night. Parks has continued to improve and restore these parklands over the years. With $6 million drawn from the 1973-74 Federal Budget, nearby Miller Field became the Gateway National Recreation Area. In 1995, Parks installed a new roller hockey rink funded by a $15,000 City Parks Foundation grant. The following year, Saturn of Staten Island sponsored the installation of a new playground.